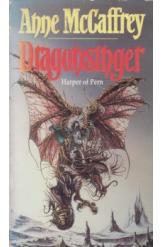 Dragonsinger by Anne McCaffrey, Sci Fi. Book is in good condition, all pages intact. Menolly has finally been brought to Harperhall, the illustrious musical academy of Pern. Her struggles are not yet over, however, as she must overcome the stigma of her backwater origins and use her innate skills and her fire lizards to impress the world. Part of the Dragonriders of Pern series.